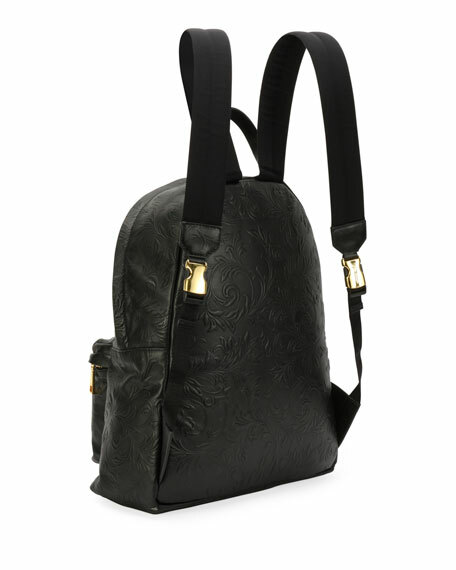 Versace backpack in embossed leather. Versace boys' backpack with logo embroidery at front zip compartment. Rolled top handle. Adjustable buckle shoulder straps. Two-way zip around closure. Interior slip pocket. Outer: polyester. Leather trim. Nylon lining. Made in Italy. Versace backpack in smooth leather. Shiny golden hardware. Flat top handle. Adjustable shoulder straps. One front zip pocket; Medusa head detail. Interior, nylon/viscose. Made in Italy. Versace backpack in solid canvas. Contrast hardware. Flat top handle. Adjustable shoulder straps. One front zip pocket; logo-stamped detail. Nylon; leather trim. Made in Italy. Versace backpack in solid canvas. Tonal hardware. Flat top handle. Adjustable shoulder straps. One front zip pocket; Medusa head detail. Versace backpack in solid canvas. Tonal hardware. Flat top handle. Adjustable shoulder straps. One front zip pocket; Medusa head detail. Interior, nylon/viscose. Made in Italy.